Andy Floyd, the general manager and executive chef for the Kitchen Table Cooking School in Greenwood Village Denver, wants to make sure Ranch Foods Direct products are available to his students for reasons that go beyond great flavor. Andy is an influential figure on the Denver food scene. 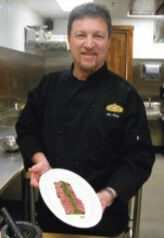 As an instructor at the Culinary School of the Rockies in Boulder, he’s helped train many of the city’s chefs. A year ago, he took over at the Kitchen Table Cooking School, which is targeted at a slightly different audience: home cooks. “Recreational cooking is learning about food, increasing your ability to connect with it and improving your skill in cooking for yourself. You can save money by not going out to eat and instead spend that money on better quality food,” he explains. The Kitchen Table hosts everything from couples classes to kids’ camps to corporate events, instilling the idea that food is the ultimate bonding experience. “We’re selling out classes right and left,” Andy says. What makes the Kitchen Table experience exceptional is a state-of-the-art instructional kitchen with enough ovens for every two people to cook an entire menu. Class sizes are typically limited to 12 at a time. “That way each person can be involved in every aspect,” Andy says. They then move to a luxurious dining room to enjoy the fruits of their labor and often strike up conversations that lead to lasting friendships. Prices typically range from $65 to $95 per person for each class. “If you think about what it costs just to go out to dinner, this is an amazing deal,” he says. The Kitchen Table offers several series for mastering the fundamentals but each class can also be taken individually. Meanwhile, the same location includes a kitchen supply store and a cafe. Andy is a Ranch Foods Direct sales affiliate.